to prepare your way among us and to call us to repentance. as we await the Messiah’s return. through your just and gracious rule. Amen. Advent is marked by a spirit of yearning for peace. May the world be filled with the peace of Christ. We long today for peace among the nations. We long today for peace among races. We long today for peace in our hearts and in our lives. Today we light two candles—the candle of hope and the candle of peace. The light of this second candle reminds us that God’s purpose in sending his Son into the world was to bring peace. We look at the division, the fighting, and the turmoil around us, and we see a world in need. We remind ourselves that peace begins with forgiveness, and that forgiveness begins in our hearts. Gracious God, we thank you for your promise of peace. We know that because of Christ, peace is possible. We pray today for the nations of the world, that we may find a way to live together in peace. We pray for our brothers and sisters everywhere, that we may become more forgiving, more understanding, and more loving to one another. Flood our hearts with the light of peace today so that we may take that light and spread your love to the whole world. Amen. Advent is the season of getting ready. Blue is also the color of Mary, the mother of Jesus. She is about to have a baby. But this will be a very special baby. This baby will be a king. But the king who is coming is not the kind of king that people thought was coming. This king had no army, no great house, and no riches. This King was a baby who was born in a barn. The King who was coming is still coming. This is full of mystery. You know, a mystery is hard to enter sometimes. That is why this time of Advent is so important. Sometimes people can walk right through a mystery and not even know it is there. This time of year you will see people hurrying in the malls buying things and doing this and that, but they will miss the Mystery. They don’t know how to get ready or maybe they just forgot. This is such a great Mystery that it takes that long to get ready. During this time, we are all on the way to Bethlehem. We are all making the journey. We are all getting ready to enter the Mystery of Christmas, so let’s go with the prophets. Prophets are people who come so close to God, and God comes so close to them, that they know what is most important. They pointed the way to Bethlehem. They didn’t know exactly what was going to happen there, but they knew this was the place. This Sunday is the time we remember the prophets. Prophets are the people who know the most important things. They knew which way to go. They are the ones who showed us the way. Because of prophets, we can go to Bethlehem, too. and cry to her that she has served her term, that her penalty is paid, that she has received from the LORD’S hand double for all her sins. A voice says, “Cry out!”And I said, “What shall I cry?”All people are grass, their constancy is like the flower of the field. The grass withers, the flower fades, when the breath of the LORD blows upon it; surely the people are grass. The grass withers, the flower fades; but the word of our God will stand forever. Get you up to a high mountain, O Zion, herald of good tidings; lift up your voice with strength, O Jerusalem, herald of good tidings, lift it up, do not fear; say to the cities of Judah, “Here is your God!” See, the Lord GOD comes with might, and his arm rules for him; his reward is with him, and his recompense before him. He will feed his flock like a shepherd; he will gather the lambs in his arms, and carry them in his bosom, and gently lead the mother sheep. I am not worthy to stoop down and untie the thong of his sandals. 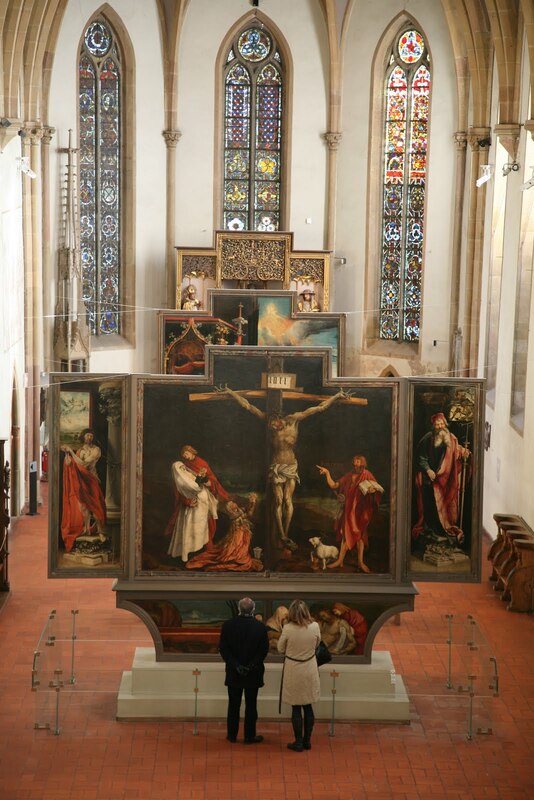 It is said that the 20th-century Swiss Reformed theologian Karl Barth wrote his most famous works in front of a reproduction of The Isenheim Altarpiece (pictured above), a work of art painted by Matthias Grunewald in 1516 for the Monastery of St. Anthony in Isenheim. 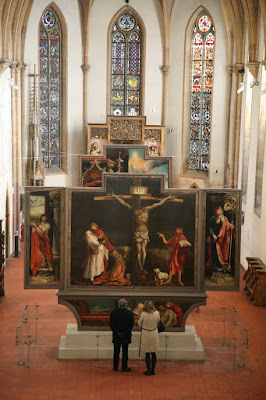 The altarpiece shows an image of the crucified Christ with John the Baptist standing next to the cross, pointing toward Jesus. 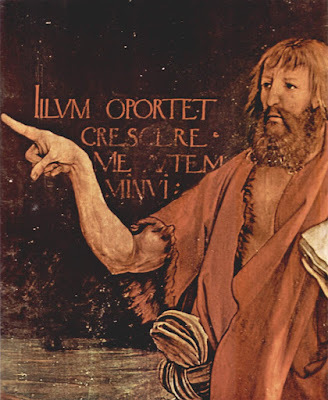 Barth liked the altarpiece for many reasons, but his favorite part of the work was said to be John the Baptist’s finger (detail pictured at the top of the page). Barth wrote that John’s extended finger represents the task of Christian life. “John the Baptist can only point,” Barth wrote, “point to the wretched, crucified, dead man.” Barth marveled at the ability of John the Baptist’s finger to “face the mystery” of Christ, the human Son of God, and call all Christians to do the same. The book of Mark begins with a superscript that sounds a lot like John the Baptist’s finger looks in the Isenheim Altarpiece: “The beginning of the good news of Jesus Christ, the Son of God.” Many believe that this is the title of Mark’s entire book. It works as a cue that the story we hear in Mark is just the beginning of the gospel, a pointed finger toward the good news of Jesus Christ, the Son of God. In other words, even at the end of Mark’s book, the reader is only at the beginning of the story. Mark invites us all to point toward this story, the beginning of the gospel, to prepare the way of the Lord, to face the mystery of Jesus Christ. In Advent we may think first about the coming of Christ as a child, but we also look toward the crucified and risen Christ, toward the mystery of the whole “beginning of the good news.” We wait for God’s ultimate reign with pointed fingers. We face the greatest mystery, the one the prophets pointed to; the one John the Baptist pointed to: the story of God-with-us in the midst of human life. We point to the day when God in Christ will gather the lambs in his arms; when the uneven ground shall become level and the rough places a plain. We point to the beginning of the gospel; the Comfort of the generations; the Radiant Dawn that has been promised. Come with outstretched arms to save us. who live in the shadow of death. Come, shine on those who are sick or alone. whom you formed out of clay.